Oh man, when you’ve got a one-off card so high up on the list, you know you’re doing something right. Diancie <Prism> is a Basic Fighting Pokemon, 120 HP, with a Grass Weakness, no Resistance, and a Retreat Cost of 2. Its Ability is Princess’s Cheers, which increases the damage your Fighting Pokemon deal out by 20 if it’s on your Bench, and Diamond Rain is a 3-for-90 move that heals off 30 damage from each of your Benched Pokemon. Damage boosting has always been a great thing to have, and Fighting decks are notorious for this. From Strong Energy to Regirock-EX, it’s always been something that Fighting decks seem to promote as of late. Diancie <Prism> adds onto the list, providing a Muscle Band’s worth of damage to any Fighting Pokemon. This makes it great for the Bench for sure…but since you’ve only got one copy, it’s not as oppressive as the others. If anything, it’s balanced out to a healthy degree. Regirock-EX is currently the big damage-booster in Fighting decks, but I can easily imagine such decks making room for Diancie <Prism>; the only thing better than maxing out at an additional 40 damage per attack is maxing out at an additional 60 damage per attack! Granted, the amount of Regirock-EX you put in will need to be worked out, and once it rotates out, it all falls to Diancie <Prism>. So that’s something to consider going forward. Diamond Rain isn’t something you wanna use, on account of it requiring 3 Fighting Energy, but if push comes to shove, it can be useful for getting some 2HKOs and healing up your guys. But everyone knows what Diancie <Prism> is gonna be run for, and to that effect, I think it’s no surprise that it landed so high on the list. Arora Notealus: Diancie <Prism> is probably going to shake up Expanded in particular, as Dark decks are fairly prominent in the format. That aside, Diancie cards haven’t usually been so…aggressive. I wonder why this one is? Probably got tired of being called silly, I suppose. Side Review: Shiinotic – the Fairy variant of the SM version, Shiinotic would work well with Diancie cards…at least, the Fairy ones. It can’t search today’s card, which is probably for the best. Can you imagine Fighting/Fairy decks that ran Shiinotic to grab Diancie <Prism> to power themselves up? Crazy. In any case, Shiinotic hasn’t made too many appearances in Fairy decks that I’ve seen, but I imagine that’s more cause he’s…superfluous in them. Next Time: And the #1 card of the set brings back another historically popular power! 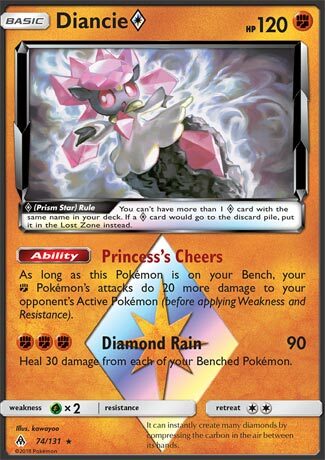 Meet another card that reminds of XY Fates Collide and our second best card of the set: Diancie Prism Star! Being a Prism Star means that you can’t have more than one Prism Star card of the same name and if it were to be put in the discard pile, it goes to the Lost Zone instead, in which cards are outside of the play zone. Being a Basic is the best due to speed and less deck space. 120 HP is quite low, as attacks that does a 2HKO will OHKO this card. Fighting types already has so much going for it in both Standard and Expanded as it can hit a good chunk Dark, Colorless, and Lightning Pokemon for weakness. It also gets support with Maxie’s Hidden Ball Trick that puts a Fighting Pokemon regardless of Stage from the discard pile onto your Bench while drawing 5 cards (which would be pointless on this Pokémon), Strong Energy/Regirock-EX and the outdated Fighting Stadium for boosting damage output. There are some anti-Fighting Pokemon, but not worth countering against. Being weak to Grass isn’t terrible as Golisopod-GX’s First Impression can still OHKO even without weakness. And a retreat cost of two is annoying since it is not easy to pay and is not searchable with Heavy Ball. Diancie Prism Star has an ability and an attack. Diamond Rain costs FFF for 90 damage, and heals 30 damage from each of your Benched Pokemon. This attack could’ve been good if it healed everyone and is Colorless friendly. It’s ability, Princess’s Cheers, only works when it’s on the Bench. When it does, then your Fighting Pokemon does 20 more damage to the Defending Pokemon. This is one of those times that I’m glad that this ability has been toned down by a mechanic. Imagine if you were able to have four of them. You would see a lot of Fighting decks than other types. The +80 boost (assuming if you’re allowed to use four of them) would make any attack worthwhile unless it’s reaching overkill territory. But that’s not the case! It provides twice the damage boost than Regirock-EX and is worth a single prize. And Diancie Prism Star cannot take advantage of itself since the ability works on the Bench. So how do you use Diancie Prism Star? It’s a natural fit for Fighting decks that need the extra damage boost to hit important numbers. Even if you can’t, then it’s a great card to have for the rest of the game. You can see it paired with Lucario-GX, Zygarde-GX, or Buzzwole-GX. Of course, you have to be very careful about using a Prism Star card due to being kicked out for the rest of the game. Ability lock can also keep Diancie from boosting damage. Overall, this has good prospects in Standard and Expanded. In Limited, it is also a nice pull that can help support other Fighting types but not as a standalone deck. Conclusion: I didn’t have many examples on how to use it, but one can see how an useful ability regarding damage boosts can fit into specific decks. Being a Prism Star card, however, does affect our perspectives regarding how playable those cards would be that were affected by such a restriction. Still, it’s a must run. Diancie Prism (FLI 74) twirls her way into the meta out of the Forbidden Light expansion set. Because Fighting types need more damage modifiers, this Pokemon has the ability Princess’s Cheers which boosts damage done to the active Pokemon by 20 points. Ok so here’s why I think the reign of Buzzwole is over: I played six matches with Buzzwole and Diancie the other night, and in five of the six matches, my opponents all had at least one Psychic Pokemon. I lost all five of those matches and only won the single game where my opponent didn’t run a Psychic Pokemon. It’s over Buzz. Your time is done. Sorry, glad you had your moment in the sun, but not even Diancie Prism can help you get out of this one. Maybe when we get the new Solgaleo GX that eliminates your weakness disadvantage, but right now you’re just not playable. I also used Diancie in Zygarde, and the twenty damage spif is really nice. I’m also planning on trying it out with the new Fighting Garchomp which is Grass weak and gains all the advantages of being a Fighting type now. I actually think that the new Fighting Garchomp might be more potent than Buzzwole right now. I’m going to try Garch out here in the next few days and see how it does… maybe I can convince Otaku to let us review Garchomp next week…. I know this turned into a Buzzwole heavy review, but considering it finished first or second in 4 of the 5 largest (Standard) tournaments in 2018, I think it’s worth discussing in relation to Diancie. Diancie definitely goes in every Fighting deck, and it will definitely help you out. I hit 200 with Verdict GX, and even OHKO’d a Zoroark GX with Cell Connector, Diancie, and two Strong energy. And I’m sure we’ll see it help Fighting decks of Pokemon that are Grass weak, but I’m not playing Psychic weak Pokemon for a while. Please note, yesterday’s CotD was posted yesterday, but I was an hour late. If you’re one of the first dozen or two people to read our reviews, feel free to go back and read mine. Our second-place pick is Diancie [Prism Star] (SM – Forbidden Light 74/131), totaling 105 voting points by appearing on all five of our personal Top 10 lists, five more than yesterday’s third-place pick and just four below our first place finisher! Some of us had it fairly high (though it didn’t top any lists), some had it a bit lower (but always still in the actual top 10). I had Diancie [Prism Star] as my second place pick, and I’m going to explain why that is exactly where it belongs. I nearly went into one of my heavily detailed reviews, even though I had to write this at the last minute and – relevant to you readers – it simply overcomplicates the situation and buries what makes this card great. Even though, as a Prism Star card, it heads to the Lost Zone as soon as it hits the discard pile, this is still an easily searched out and Benched Basic Pokémon, especially in [F] decks that run Brooklet Hill, that provides a sweet +20 damage when your [F] Types attack while it is on the Bench. Yes, it does this via its Ability and Abilities – especially on Basic Pokémon – can be negated. It has just enough HP not to be a super-easy OHKO (or worse, bonus Bench KO), but its attack is filler (and doesn’t benefit from its Ability – check the wording). If your deck’s main attacker is an [F] Type, unless you’re also running something that would shut down your own powers, you run this card. Which probably doesn’t sound like it would be worth the number two spot on our list, at least at a glance. What makes Diancie [Prism Star] so good is the rest of the current metagame. Zoroark-GX makes exploiting [F] Weakness quite valuable and Buzzwole-GX means we already have a successful [F] Type that benefits from the bonus. Damage bonuses only matter if they trigger an effect or decrease the number of turns required for a KO; [F] Type Pokémon are already known for stacking multiple damage bonuses, but instead of being needlessly redundant, this just expands their damage range while making it more likely that a deck will have access to at least an easy +20. I’ve been raving about this beauty about almost the entire Top 10 series now, and now its finally time for its explain and point out on its future relevance. Diancie Prism Star is, compared to most Prism Star Pokemon, rather frail. Having 90 HP means it can’t soak even the slightest of hits (apart from a Claw Slash from Dusk Mane Necrozma-GX that deals 60 damage – but even then that’s it). Nor its 2 retreat cost, which means once it gets dragged by Guzma to the active, it’ll be at their mercy. And since its a support Pokemon, how much of your time will be spent at attaching 2 energy to it? Its weakness to Grass is rather irrelevant, but its main typing in Fighting is not, with it enjoying access to Brooklet Hill and Strong Energy, if need be. This Brooklet Hill accessibility is one of the strongest points Diancie has, as will be explained later. Being a Prism Star Pokemon means you can bring only 1 copy of this Diancie in any deck, but as we see later, this is more than enough. Diancie’s main sparkling stone is its ability, Princess’ Cheers. Rallying its fellow Fighting types, when Diancie* is in your side of the board, each of your Fighting Pokemon deals an extra 20 damage. So what does this mean, anyway? Good question. This means that Diancie* is a power crept Regirock-EX (XY FCO), being a 1 prize Pokemon and giving 10 more damage to your Fighting types (20 > 10). This is HUGE. Like the real deal. Which is better, having multiple copies of 2 prize tanky liables on your bench dealing minuscule damage or having 1 Pokemon with low HP, only 1 copy can be inserted and can be prized but only gives up 1 prize and 10 more damage? This is where the benefits of Diancie* starts to shine. Having a damage booster where you can just slap it down and practically leave it to be with little damage to you since its a 1 prizer is where it shines over Regirock-EX, where its 2 prize status makes the latter a very good source of prizes, especially in the late game. Being a Fighting type also synergies with this strategy, meaning that you can slap a Brooklet Hill down and search for it on your Turn 1, then leave it be. And why is this important? Let us divert ourselves to the meta. Buzzwole-GX is the meta, and with the addition of Beast Ring and Beast Energy, it has become more powerful than ever. Diancie* is a beautiful addition to this deck – its a Fighting type, so Princess’ Cheers can work on Buzzwole (and also Lycanroc if the deck runs it), and provides a stronger damage game overall. I’ve mention several damage calcs in the past, such as being able to OHKO Zoroark-GX with Jet Punch with Beast Ring, Choice Band and the Princess’ Cheers buff. Yes, an OHKO for 1 energy. Diancie* can also work with all Fighting types, benefiting from the Brooklet Hill they often pack and also the damage boost it gives to them. Bear in mind that Diancie cannot work in Garbodor-based Fighting decks since Garbotoxin can invalidate the ability. It has an attack, yes – in Diamond Rain, a 90 for 3 Fighting energy attack that heals 30 damage from each of your benched Pokemon. Well it can stop spread damage diseases from the like of Tapu Koko (SM30, SM31)’s Flying Flip, but its overpriced and underpowered. Its weaknesses? Well, apart from the obvious like being a Prism Star meaning if its prized sometimes your damage calcs can be off, for example in the Espeon matchup. Its a 90 HP Pokemon, so it has bulk issues, but hey its a 1 prize support Pokemon so whatever. But probably the worst is that it is very type dependent – its a color-specific damage booster. But again, I said that Princess’ Cheers alone is worth the trouble against this all solvable problems of the diamond princess, and every Fighting deck should pack this thing to be competitive – its THAT good.